Next morning we were greeted again by blue sky and sunshine, just the right kind of weather for a trip to the island of Ruegen. But work comes before pleasure, if not for us then for our tec-divers who seemed to be of a slightly masochistic disposition. Their gas order, consisting of nineteen 50l steel tanks with a combined weight of two tons, had to be manually lugged aboard and safely secured, since the weather forecast predicted storms. This was hard to believe, considering the fact I was wearing sunglasses that morning, but then what do I know - I'm just a landlubber! When everything was safely stowed, the majority of our group decided to go with Michael to visit the navy museum of Peenemuende, whereas Jessica and I decided to drive to the Isle of Ruegen to be ripped off by the locals. Had we known that for the next few days we'd be mostly in the vicinity of Ruegen, we could have saved ourselves quite a few euros! And as if to prove that we really are landlubbers with no understanding of sea, the weather turned during the afternoon and it began to rain in heavy showers. Back on board we were given the bad news that the storm warning had been expanded in terms of severity and this time we even believed it! In the course of the afternoon and early evening the remaining guests arrived, apart from three guys from Cologne who boarded the Artur Becker at midnight. we dragged ourselves on deck half an hour later to learn about putting on a life vest and where to find the survival suit. 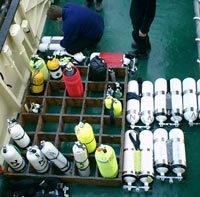 Then came the hard part: how were we to secure all the equipment (including at least 8 double tanks) so that they were storm-proof? After we had solved that conundrum, we devoted ourselves to eating breakfast, while the ship set off. across the sea bed. 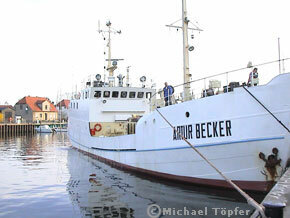 The chain even led to a ship - not a wreck, however, but back to the Artur Becker, where hot tea was already waiting for us divers. Not all divers were put off by the lack of sights and some jumped right back in after dinner for a night dive in the 5° C cold water. In contrast to the earlier dive I noticed that all the mussels were now open. That was all - not a fish in sight! The majority of us had decided to give the night dive a miss and go straight for the decompression beer. Be it tekkie or air aficionado - they all agree on the medical properties of a decompression beer! Once again it was proven that the Taucher.net people are a friendly bunch and although most of us didn't really know each other, it took only a few minutes (and some beer or coke) for us to swap stories and experiences. With Anke and Brian as "representatives" of Britain, one of the main topics was the differences in British and German dive practices. We particularly discussed the question, of why the use of Nitrox is less common in Germany. 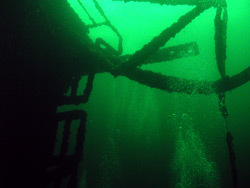 from the ship's cook in the galley, the Artur Becker was already under way towards the MS Førkrat, the wreck of a cargo ship, which probably sunk during World War 2, with a length of about 180m and a width of about13m. When we had reached the location, Michael and a group consisting of members of the Greifswald dive association and the crew dived down to the wreck to secure a marker buoy next to it. Meanwhile we gathered on deck and listened to captain Hanke's briefing. The Førkrat lies upright on its keel in about 45m of water, and the superstructure extends to a depth of about 35m. Following the shot line you reach the bridge, from where you can explore the ship, its cargo holds and superstructure. the difficulties of this dive should not be underestimated. After the briefing the buddy teams got their gear ready, the tekkies started to calculate their dive plans, lamps were checked; in short everyone got ready. While the first teams were kitting up, our marker buoy team returned. Finally our team, consisting of Jessica, Christoph and myself, got under way. We quickly descended along the shot line into the deep. Arriving at the Førkrat's bridge we took some time to orientate ourselves. Then we started to explore the ship. We had strong lights, expecting it to be very dark. However, at 40m it was still light enough to get a good overview of the wreck, something we fresh water divers were not really used to. The visibility was quite good, too - about 15m. 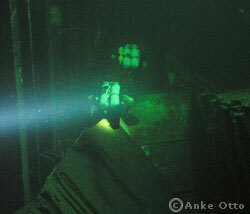 The only problem visibility-wise was a thermocline at 41m. When I was diving through it, I got the feeling I had suddenly lost both contact lenses. The real shock was the temperature displayed on the dive computers: 2.7 ºC! Very deep and very cold (without strong currents and with quite a bit of surface light, however) - ideal circumstances for nitrogen narcosis. Keeping this in mind, we moved about really carefully and didn't dive deeper into the cargo holds. We kept to our plan and started our ascent after about 20 minutes - having accumulated quite a bit of decompression time. During the last five minutes of our decompression time in particular I got really cold and the first thing I did back on board was not to get out of my dry suit, but to get a mug of hot tea from the galley! notice that he had trapped a few fibres with the O-ring, so that he had the feeling that his glove was soaking up the water and he decided to abort the dive. Jessica and I handed him over to a group just doing the final minutes of their 6m decompression stop. Then we continued our descent. Upon arrival at the bridge, we realized that the current had grown a lot stronger and that the thermocline had risen a couple of meters. 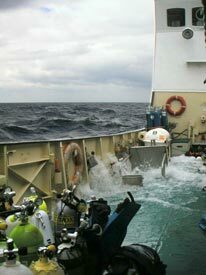 We, too, decided to stay a bit higher up than during our first dive, so as not to build up too much decompression time. The advantage was that we got more of an overview of the wreck, instead of the more detailed impressions from the first dive. After a while we decided (with a heavy heart) to start the long ascent to the surface (and to the warm mugs of tea aboard the Artur Beckker). When all of the divers had returned on board the Artur Becker, the captain set course for Arkona Bay again, to anchor there again for the night. After dinner most of us met at the bar. That evening Brian and Anke introduced me to the concepts of the "Incident Pit" and "Risk Analysis", both of which are not really known here in Germany. I found especially risk analysis as a means of planning your dive extremely interesting and have since adapted it for our club. Round about midnight we sank into our berths - exhausted from extremely interesting, but strenuous dives. 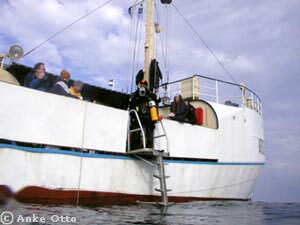 had decided to stay within the vicinity of Ruegen and we were heading for a small wreck nearby. The wreck is a wooden ship (length about 20m) dating from the late 19th century. Very little is known about it and it was named Saja after the first persons, Sarah & Jan, to dive there. 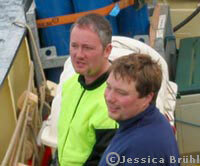 The briefing was held after the Greifswald dive crew had positioned the buoy next to the wreck. It was stressed in the briefing that the remains of the ship are extremely fragile and the necessary care has to be taken when diving the wreck. The second part of the briefing was about the dive itself: very high waves, low visibility and a strong current. It was emphasized that despite the shallowness of the wreck this was a fairly demanding dive. 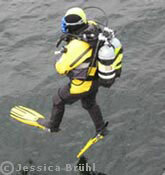 Some of the non tec-divers took that to heart and decided not to do this dive. The tekkies didn't want to go down, either, too shallow and the wreck not interesting enough! The rest of the divers paired up in buddy teams. Christoph and I decided to join Heiko (Don Mojoto) and Till, our motto being: “it's better to drift off in a group than as a single diver”! As announced, the wreck was far from spectacular. Still, it was an interesting dive (and quite exhausting due to the really strong current) since we had lots of bottom time to explore the wreck from all angles and devote some time to a group of cod hiding beneath the deck. Ours was the last group to ascend, as planned well within the no decompression limit, since none of us were keen on having a prolonged decompression stop in that kind of current - it was strenuous enough to do the safety stop. Back at the surface we had to swim quite a distance back to the Artur Becker, which proved very difficult due to the waves and the strong current. Getting back on board via the big ladder was no mean feat, either! 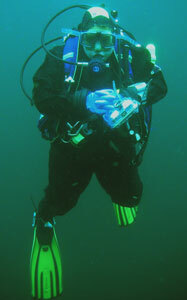 The weather had worsened again during our dive, so a second dive was out of the question. 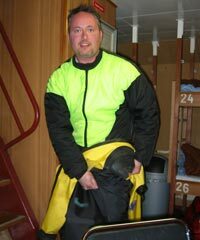 In fact, Captain Hanke was happy when we were finally back on board and immediately set sail for the sheltered Arkona Bay. Despite the wind and the high waves breaking on deck, the ship didn't roll or pitch too much on the way. We weren't the only ship heading for calmer waters. As the weather forecast had predicted a full-blown storm, quite a few ships were heading towards Ruegen. When the Artur Becker had anchored the crew started to prepare the highlight of the day: BBQ on deck during gale force 8 to 10! Although fairly secluded, the wind blew with considerable force and yet the crew managed to light the barbie and soon delicious smells of barbecued meat (either in the form of steaks or sausages) was wafting through the ship and lured most of us (wrapped up in warm anoraks or windcheaters) on deck. 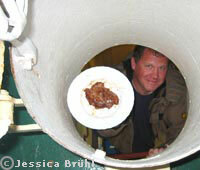 In the second cabin some of the divers discovered a way of getting to the food without getting cold, by using the emergency hatch which was converted (as it was situated right in front of the barbie) into a put-steak-on-plate-hatch! 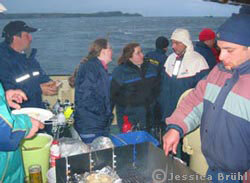 For us hard boiled seafaring folk, however, the wind and rain party was huge fun! When even the biggest tummy had finally been filled, we relocated to the bar where we celebrated our last evening together. Werner, who already had made a name for himself as a provider of Austrian treats, like cured ham, cheese and several bottles of home-made schnapps, dispensed wine from his local winery. The festivities ended with Heiko's by now legendary bread roll dance - a dance which left nothing to the imagination! Shame that this was the last evening. Once again it had been proven that Taucher.net meetings are heaps of fun. 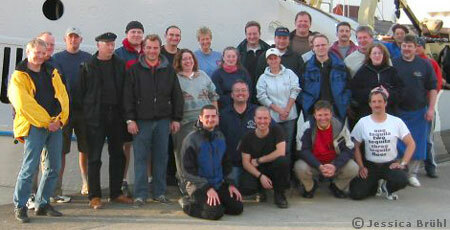 of the wreck diving tour. Armed with my toothbrush I went on deck on my way to the bathroom, when I had to pause for a moment in complete surprise: blue sky, no waves and no wind! When we all had finished breakfast, the Artur Becker had reached the wreck's permanent buoy (necessary, as it lies in shallow water in the middle of a sea channel with heavy traffic). We congregated on deck where Michael held the briefing. The Jan Heweliusz, a Polish ferry had sunk during a storm on 14.01.1993. 55 people had been killed when the ship sunk, most of them truck drivers (more information - in German - can be found in an article of the 6th edition of the TN-magazine. 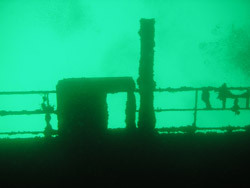 The ship lies on its port side at a depth of about 24 - 12 metres and its silhouette could even be seen from the deck. 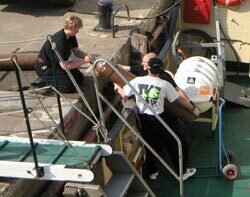 Due to salvage work a part of the hold is accessible from above without the need to penetrate the wreck itself. 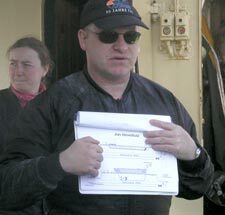 After the briefing we got ready and then descended along the line to the stern of the ship. 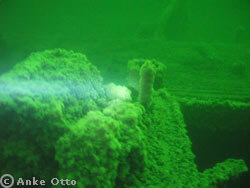 Visibility was fantastic and the wreck exceedingly impressive due to its sheer size. As the Jan Heweliusz lies in really shallow water there is enough no-compression bottom time to inspect the whole length of the wreck. We reached the part where the starboard hull had been opened und it was possible to dive to the sunk lorries. Like everywhere else, mussels had taken possession of the debris. The wrecks of the lorries, all wedged into each other, provided a good impression of the forces at work during the sinking of the ferry. From the hold we went to the bow, where we disturbed a huge swarm of cod. 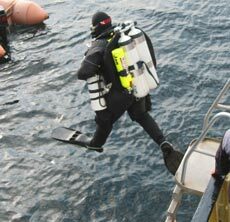 After we had inspected the bow propellers we commenced our ascent. Back on board, after having secured a decompression tea for myself, we talked about the plans for the rest of the day. Obviously we wanted to do another dive at this exceptional wreck, but it was 5 hours to Greifswald and the group which had delayed our departure insisted on returning at 6 pm at the latest. Well, tough luck guys! 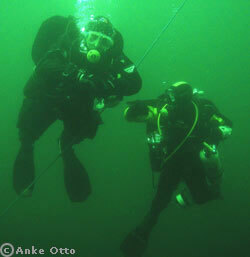 We therefore decided to postpone lunch, fill our tanks and do our second dive more or less immediately. Our team decided to do a special dive as our last dive: guided by Michael who knows the wreck like the back of his hand, we wanted to dive through the length of the hold. sharp right and voila! we were back outside. Here good gear configuration proved to be very important as one didn't want any hoses sticking out, which would mean a danger of entanglement. Thanks to the members of the Dive Club Greifswald and the crew of the Artur Becker under the command of Captain Hanke we had a great trip! come up on the deck. I'll try to get a bit closer, to give you a better photo opportunity". Naturally we all went up on deck and watched the huge ferry cruise by. Somehow most of us had a strange feeling considering that we had just dived at the hapless sister ship's wreck. 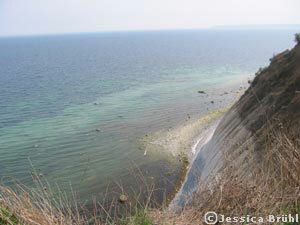 The rest of the trip was uneventful, on the calm blue sea - the Baltic Sea as it should be. It would have been great if the weather had been like this all the time. But I don't want to complain - we dove at two exceptionally interesting wrecks and the dive at the Saja was interesting as well. 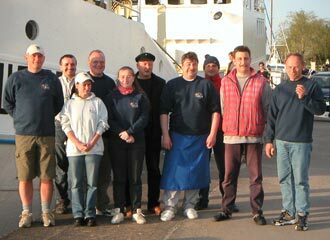 The crew (especially ship's cook Udo) did a great job, which together with the support by the members of the Greifswald Diving Association, made for four great days. I therefore want to especially thank them all - after all the weather wasn't their fault. It was definitely a exceptional Taucher.net meeting, well organised by Jan who deserves extra credits for the idea and planning and execution of this meeting. Back in Greifswald all that was left to do (after Customs had been on board) was to take the customary group pictures, afterwards crew and guests went home - which in some cases meant a really long journey. So, what did we take home from this trip (apart from brilliant memories)? 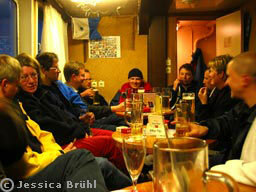 Tec and recreational divers can dive together, talk together and drink together at Taucher.net meetings!